Summer is here and it seems like we won’t be escaping the warm weather anytime soon. 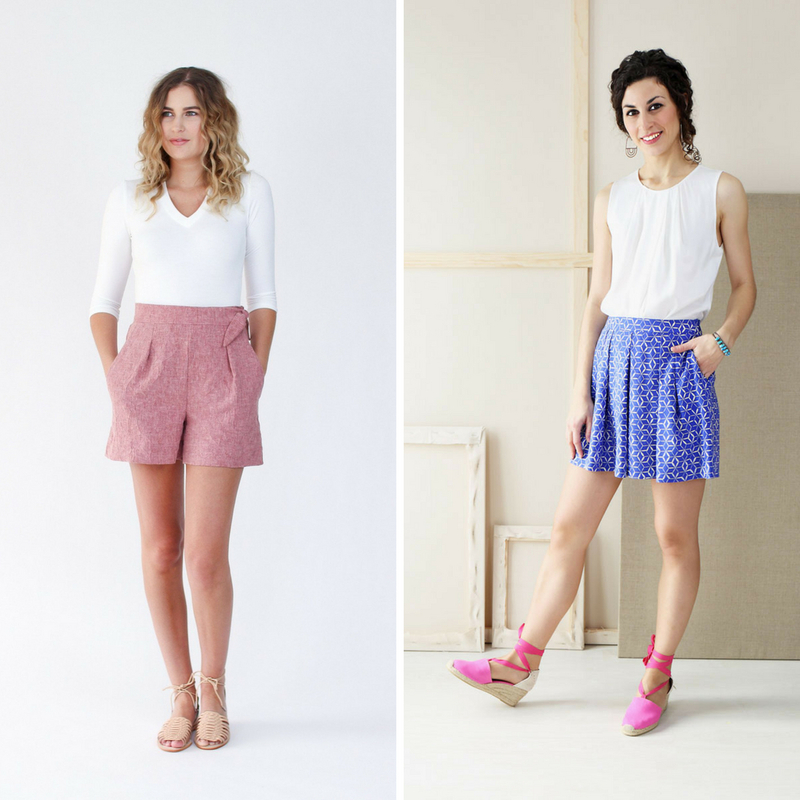 In efforts of making the most of it and keeping cool we are are comparing six indie shorts patterns to help you pick the right one for your style and fabric. These six fit into three main categories which will help narrow our comparison—Classic Fit, Light & Airy, and Stylish Twist. We’ll also include a chart at the end that helps summarize all of the results. If simple lines and a timeless look are your style then these are the shorts for you! The Lander and Nagoya shorts both offer a sleek, classic look and fit that are ready for anything. From hiking and biking to lounging in the back yard, they are both designed for comfort and versatility and will pair well with any summer top. Both feature a higher rise that sits around your natural waist. The differences are in the details. The Lander offers a button fly, patch pockets and more tailored silhouette. The Nagoya has a more traditional slash side pockets, zip fly and a roomier flared leg. Both patterns include shorts length cut lines but can easily be lengthened to fit your style. In terms of fabric choices, both patterns pair well with a range of wovens and bottom weights. Due to the more tailored fit, we like a heavier weight woven for the Landers, such as a cotton twill, denim or heavier linen. You can get away with some lighter fabrics for the Nagoya such as a tencel twill, linen blend or sateen. Neither pattern calls for stretch but with some slight modifications or sizing down this would be a great option. 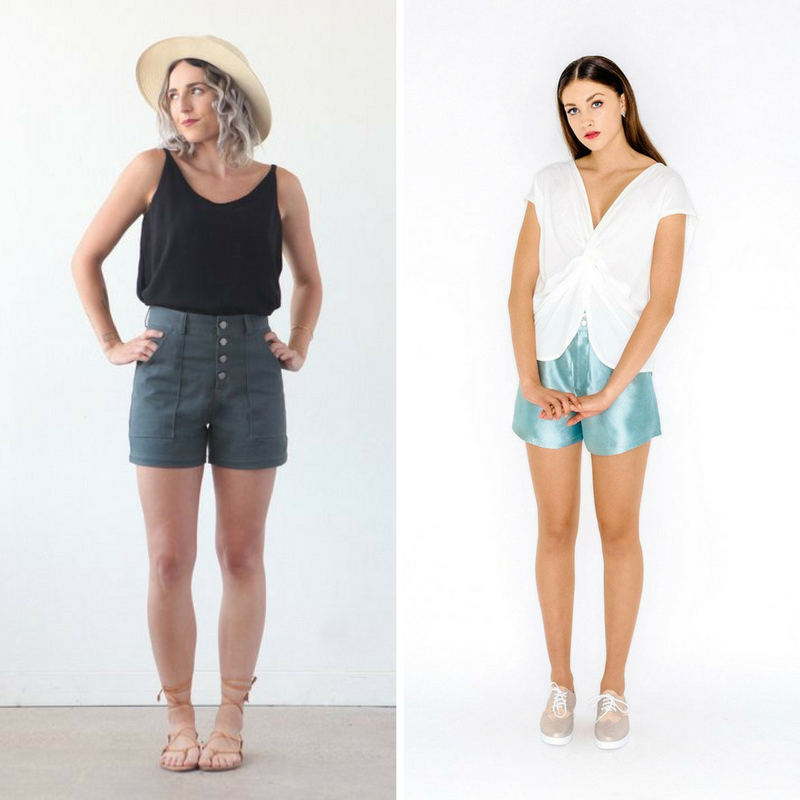 If the summer heat has got you down, try either of these flowy summer shorts! Perfect for when you don’t want something so fitted and clingy, the Flint and Soho shorts are light weight and breathable. Both feature a pleated silhouette that offers great movement and style. Dress them up or down depending on the occasion this summer! While these patterns both fit in the “Light & Airy” category they are quite different. The Flint offers a unique construction with the closure hidden in the overlap of the left pocket. It sits at your natural waist and uses front pleats and back darts to create it’s feminine silhouette. The Soho shorts are more similar to a culotte and sit just below your natural waist. With front and back pleats, invisible side seam zipper and pockets these shorts are more voluminous and a bit more dressy. Fabric choices for both of these patterns include light to medium weight wovens. While they don’t specifically call for fabrics with lots of drape, these are our favorite—Rayon challis, rayon crepe, tencel twills, linen blends, you get the idea! For a little more body and structure for the Flint Shorts try a cotton twill, light weight denim or even a cotton shirting. Now for a twist on this discussion of shorts! This season there are two stand out trends in ready to wear, jumpsuits and overalls. So why not try a shorts version of both of these fun looks? Both patterns offer some versatility in the look and styling. For the Yari choose between short sleeves or sleeveless and for the Jenny include the front bib or not. Both offer a classic straight leg and accentuate your natural waist. As with the styling, the fabric choices for these patterns are quite different. For the Yari look for a light to medium weight woven such as a linen, chambray or rayon. We like ones with a bit more drape like a tencel twill or linen blend. The Jenny Overalls call for a medium to heavy bottom weight, like a cotton twill, denim or heavier weight linen. The best part—Most of these patterns offer a range of lengths so you can use them year-round. You might already have them in your library or find that now is the perfect time to add them. Enjoy your shorts and get the fit just right this summer, then you will be all set to sew up longer versions this fall! Pro Tip: Rather than sew a full length muslin of a pair of pants, sew up a shorts version. This not only saves on fabric and time, but also might get you a wearable pair of sorts when your are finished! A great idea for jeans, especially! Hopefully you find this comparison helpful—sometimes having all the information in one place makes the decision making process a bit less daunting. You might have even found a favorite that wasn’t already on your consideration list! If you’d like to see more comparisons like this let us know in the comments! way. I’m sure it wasn’t easy, but it would be wonderful to choose other things such as blouses or skirts (in your spare? time). Unfortunately I’m probably old enough to be the models’ grandmother, but as my shape keeps changing (everything starts dropping after 40 – so if I didn’t have such long legs my derriere would be on the ground) There may be hope for the Flint, which I never would have discovered without this wonderful article. Thank you very much! Great comparison and timely article. I’ve been looking at the Flint pattern. No zipper a plus. May have to take a closer look at the Soho shorts too. Really helpful, I’m keeping the chart as a reminder to read suggestions for fabric on pattern envelope. Great article, yes please write more comparisons in the future. Of the the styles, I found one I liked in each category. Win! We had to wear those shorts jumpsuits for PE back in the 70s. Still about as flattering.